Most all of my paintings contain animal images because I have a great love for the animals in my life nurturing those close to me in my home and admiring those of a wilder nature. They have taught me much about myself and their beauty never ceases to amaze me. However, the greatest gift they have given me is their love. They all reside within my heart teaching me to be a better human. 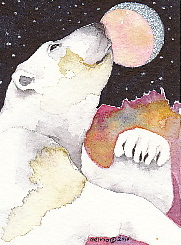 If you are interested in commissioning a painting please contact me and we can discuss a possible painting. You will see some commission possibilities below. I believe that our most powerful tool as human beings is what we call our intuition. Our heart feeling. Messages from our inner self come through when we listen. All cultures have messengers of truth. 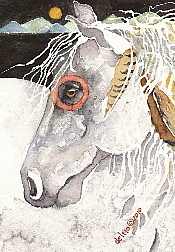 We all have spirit animals or totem animals ready with guidance taking us within. For the last 20 years I have enjoyed a continuing magical experience with the Blue Heron. Wherever I live I discover one of these majestic birds practically living in my backyard. I am always in awe watching the behavior of my Heron. You could call this my imagination, but I believe it is not a coincidence that the Heron in always in my life. Whatever the reason may be I can tell you that seeing this bird uplifts me taking me out of my busy mind. 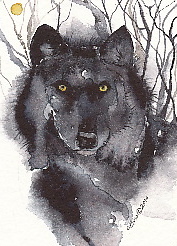 I have always been drawn to wolves. I feel their nature within my many dogs and I have also known a few wolves along the way. Recently I have been meeting new wolves. Amazing creatures. Just watching them run is exciting. They don't run the same way that dogs run. They have a special fluiidiiity to their gait. 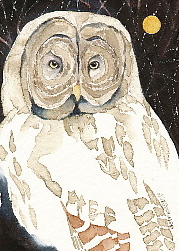 All the animals that I paint have a special significance for me. I feel a bond with each animal. If you are interested in a painting of your spirit animal perhaps with symbols please contact me and we can discuss a possible painting. I live in the San Bernardino mountains 90 miles east of Los Angeles. Yes...we have lot's of snow in the winter. My dogs love to play in the snow. We all love our pets here in the little mountain community where I live and most everyone shares their life with at least one.